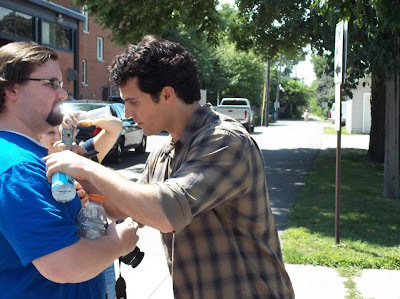 “Henry, can I get your autograph?” I reached into my pocket and pulled out my In-Case-Of-Famous-People marker.“I don’t have anything to sign so will you sign my shirt?” I decided long before I went on the trip that I wasn’t going to be one of the fan boys that wore a Superman shirt to hang around the set. I am a nerd but I still have some self-respect. However, I did wear a blue t-shirt that resembled the blue of Superman’s costume. I figured that was close enough to count as being fan without going over the top. OH. MY. GOSH. You have to read the whole thing, including Deanna's experience (pictured below). 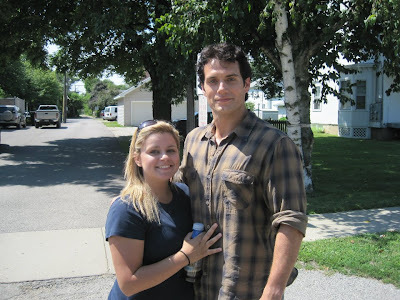 Like always Henry was a class act with fans. So excited for him and the success that will come with Man of Steel! Hey, thanks for posting this! Of course! - thank you for sharing. Much appreciated. Will fix that ASAP. Thanks for flagging us about it and sharing the great pic. Sorry!